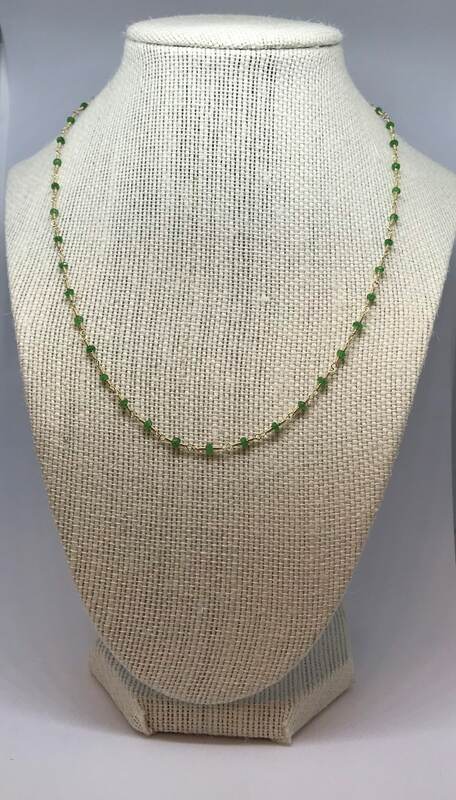 This 2x3mm faceted rondelle Tsavorite Garnet beaded necklace is handcrafted with 14k gold filled wire and findings. The necklace measures 18 inches long with a 2 inch extender chain. What does gold filled mean? Gold filled is 5% 14k gold bonded to either sterling silver or a base metal core through heat and pressure. Gold filled should not be confused with gold p three lated, which has a very thin layer of gold, whereas gold filled has a much thicker layer of higher quality solid gold, making it more durable, and creating a long lasting beautiful look.